Because the game does not allow copy-paste, I can only solve this problem programmatically by creating a(n) fcitx module with the iconv. The module is available here. 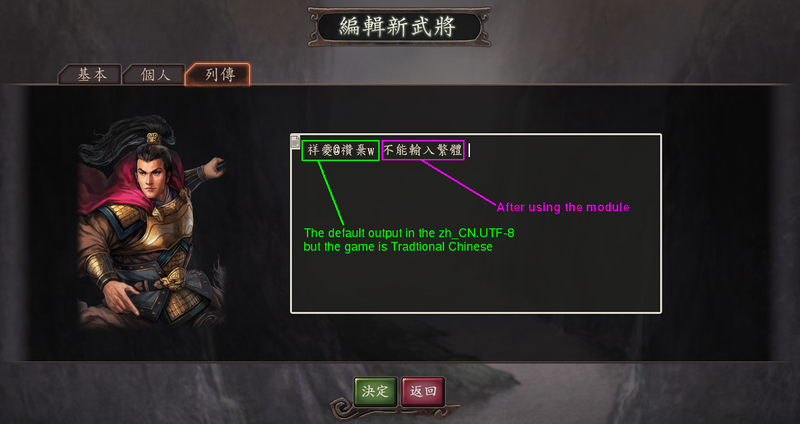 Note: In order to use the module, that is to convert the GB18030 to BIG5 (yet still UTF8), because BIG5 is Traditional Chinese, that means we need to enable the “Simplified Chinese To Traditional Chinese” module in fcitx. Then only input the Traditional Chinese characters will work. Such as entering 會 instead of 会. Because BIG5 does not have the character for 会, but 會. Because of the question mark problem as mentioned above, I can only give up playing the game with WINE. There is no choice but only to play the game with Windows in the VirtualBox which works fine in the Chinese (Taiwan) locale. Update (2014-06-18): With the latest version of Wine 1.7.20 and fcitx 4.2.8, after using the module, all the words can be encoded as BIG5. I learnt Cangjie input method before. Difficult to learn, difficult to memorize. Give up finally. Cangjie input is target on Traditional Chinese characters. Recently, I tried Wubi input method, which is target on Simplified Chinese characters. Compare to Cangjie, it is easier to learn, easier to memorize. Not because the poem, but the rule of stroke layout on the keyboard is systematic. And I am learning Wubi 86 version. So, using these input method, I can type the Chinese character without knowing how to pronounce the word. It is an alternative input method I think I need to learn.